A family member of the victim also confirmed the assault, noting that the woman was later hospitalised after the unfortunate incident. "The scene today was very terrible at the Mobil Petrol Station along Oba Ile road. The woman in question only parked her vehicle at the front the filling station. By the time she returned to pick up her vehicle, the attendant at the station challenged her for parking without any permission," he said. "She explained and pleaded, but the attendant refused to listen to her excuse and in the process, the other attendants joined and demanded to know what happened. Before we knew it, the attendants became confrontational, and invited other boys, numbering about seven, to deal with the woman. "They nearly beat her into a state of coma, as they molested and inflicted her with injuries. "Yes, it is true. Seven hefty men who are attendants at the station turned my two sisters into a punching bag and beat them mercilessly. The most very annoying part was that the whole scenario took place in the presence of the owner of the petrol station. "The issue would have been sorted out before coming to our station to report the case, but let me hint you that two out of the attendants have been arrested. 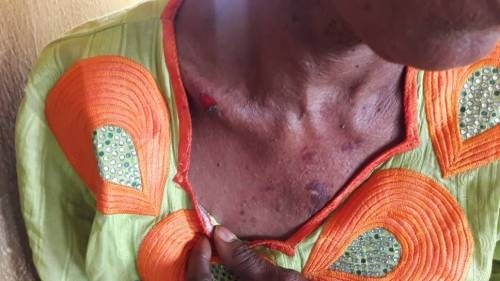 Also, we have started investigation into the case and I am aware that the assaulted woman and her sister are currently receiving treatment at our Police clinic," he said.